“U” magazine – Engagement ring competition. Home / Press / “U” magazine – Engagement ring competition. It’s time to spread a little love. Here is the competition from “U” magazine featuring a diamond engagement ring competition. Valentine’s Day season is one of the most popular times of year to propose. So time to get prepared! 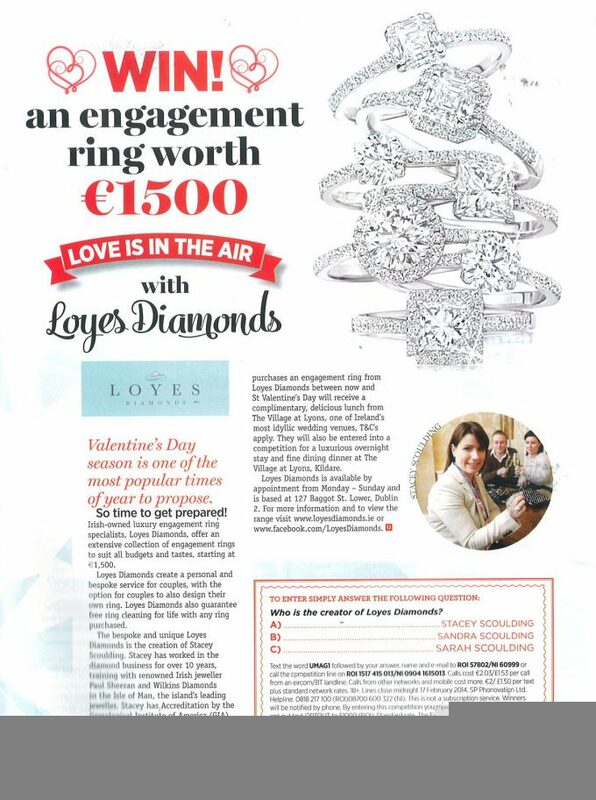 Irish-owned luxury engagement ring specialists, Loyes Diamonds, offer an extensive collection of engagement rings to suit all budgets and tastes, starting at €1,500. Loyes Diamonds create a personal and bespoke service for couples, with the option for couples also to design their own ring. Loyes Diamonds also guarantee free ring cleaning for life with any ring purchased. The bespoke and unique Loyes Diamonds is the creation of Stacey Scoulding. Stacey has worked in the diamond business for over 10 years, training with renowned Jeweler Paul Sheeran and Wilkins Diamonds in the Isle of Man, the Islands leading Jeweller. Stacey has accreditation by the Gemological Institute of America (GIA), the most respected Institute in the Diamond Industry. In addition, any client who purchases and engagement ring from Loyes Diamonds between now and St Valentines’s Day will receive a complimentary, delicious lunch from The Village at Lyons, one of Irelands most idyllic wedding venues, T&C’s apply. They will also be entered into a competition for a luxurious overnight stay and fine dinning dinner at the Village at Lyons Kildare. Loyes Diamonds is available by appointment from Monday – Sunday and is based at 127 Baggot St. Lower, Dublin 2. For more information and to view the range visit www.loyesdiamonds.ie or www.facebook.com/loyesdiamonds.